In late May 2012, an estimated 20,000 Mexicans took to the streets of Mexico City, converging on the offices of Grupo Televisa, the largest media company in the Spanish-speaking world. Quickly dubbed by the international press as the “Mexican Spring,” the protest demonstrated the popularity of the #yosoy132 student movement and its allegations that the media giant colluded with the incumbent Institutional Revolutionary Party (PRI) to promote its presidential candidate and limit coverage on PRI opposition. The protest began with 131 students gathering outside the private Iberoamerican University where then-PRI candidate and now-President Enrique Peña Nieto was making a campaign visit. The students’ demands focused on the prevalent use of state violence during Peña Nieto’s term as governor of the state of Mexico. But within days, the protest transformed into a mass movement decrying party corruption and media payoffs. On Televisa programming, which accounts for roughly 70 percent of the domestic market, Peña Nieto’s constant and favorable presence contrasted sharply with that of rival Party of the Democratic Revolution (PRD) candidate Andrés Manuel López Obrador. Vociferous criticism erupted when Televisa declined to broadcast the first presidential debate, airing instead its regular primetime telenovelas. Paraphrasing a 2011 statement by PRD head, Jesús Zambrano Grijalva, protestors marched against Televisa with signs that read “Gobernar no es una telenovela” (Governing isn’t a soap opera), referring to both the debate incident and the media’s glowing coverage of Peña Nieto’s 2010 remarriage to a prominent telenovela actress. While Peña Nieto pledged in his inaugural speech to improve the competitiveness of the telecommunications market, the presence at the event of Emilio Azcárraga Jean—the third member of the billionaire Azcárraga dynasty to head Televisa—did little to convince PRI critics that major reform was imminent. To achieve his inaugural promise, Peña Nieto would have to confront the more than six-decade relationship between the PRI, Televisa, and the Azcárraga family from which Mexican broadcast journalism was born. These intersecting and mutually reinforcing paths walked by an ascendant PRI and Televisa rest at the center of Celeste González de Bustamante’s monograph “Muy Buenas Noches”: Mexico, Television and the Cold War. A former journalist and news anchor, now assistant professor of journalism at the University of Arizona, González de Bustamante explains how Mexican broadcast journalism, dominated by Televisa, helped the PRI craft a cultural hegemony that undergirded decades of one-party rule. This partnership institutionalized the PRI’s vision of the precepts embodied by the Mexican Revolution (1910-1920). The author crafts her narrative around analysis of five chronological case studies that reveal how negotiations between politicians and industry executives shaped the top-down dissemination of the nation’s image on domestic and international stages. What results is the unmasking of a multi-decade, private-public venture to manicure a portrait of Mexico that conformed with its “miraculous” post-war economic growth and ambivalent Cold War posturing, through the broadcasting of what was, in effect, a Technicolor Potemkin nation. In 1970, Gil Scott-Heron recorded “The Revolution Will Not Be Televised,” a spoken word track that drew inspiration from a slogan popularized by the previous decade’s black power movements. The poem reflected on the media’s post-war tabloidization and sitcomization, which signaled a turn away from addressing issues of social inequality. Real social change, Scott-Heron declared, would not be co-opted by the media, would “not be brought to you by Xerox in 4 parts without commercial interruptions.” As González de Bustamante shows, however, in Mexico the PRI and its supporters understood that its brand of revolution would indeed be brought to viewers by corporations through programs like Noticiero General Motors. This show, which premiered in 1950 on newspaper titan Rómulo O’Farrill’s Channel 2, introduced the nation to Jacobo Zabludovsky, an intrepid newsman who curated, and later narrated, Mexico’s news. Whereas the United States was sent to bed with Murrow’s “Good night and good luck” and Cronkite’s “And that’s the way it is,” Mexicans turned on their sets to Zabludovsky’s “Muy buenas noches” (“Good evening”). Unlike his U.S. counterparts, however, Zabludovsky never gained a reputation for objectivity. Criticized over his long career as a “solider of the PRI,” his ties, like those of the industry at large, to the party were strengthened in 1955 when O’Farrill and Emilio Azcárraga Vidaurreta (the grandfather of Televisa’s current CEO) chose conglomeration over competition. The resulting entity Telesistema Mexicano, Televisa’s predecessor, used legal loopholes to control and standardize the content broadcast by Mexico’s three major channels. 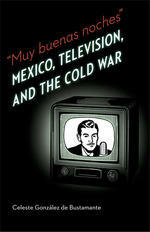 Though González de Bustamante provides a captivating institutional history of the television industry in her first chapter, she reserves the core of her study for analyzing the media’s response to many of Mexico and the PRI’s quintessential Cold War confrontations. She builds her analysis around archival evidence, including transcripts from broadcasts she discovered in unprecedented access to Televisa archives. She also engages skillfully with not just the growing field of scholarship on Mexican television, but also with that of the cultural history of the dictablanda, or soft authoritarian regime, through which the PRI governed for more than half of the twentieth century. By narrowing her focus to the period between 1950 and 1970, she is able to tease out the impact of Cold War international politics and domestic challenges faced by the PRI while also staying attentive to the nuances of class, race, and gender. The book’s second chapter explores the invention of what González de Bustamante calls “tele-traditions,” or televised coverage of national and religious holidays. She focuses on the first broadcasts of Independence Day celebrations in 1954 to demonstrate television’s homogenizing effect on mexicanidad (Mexican identity). Though initial broadcasts reached only a minority of viewers with economic means to own a television, increasing purchasing power allowed families in subsequent years to watch the celebrations at home, turning a public affair into a privately consumed event. The broadcasts of festivities in the capital, marked by an absence of female and indigenous faces, also disrupted local traditions by showing viewers how and by whom the day should be commemorated. Next, González de Bustamante examines the inconsistency of Mexico’s Cold War ideology by comparing media responses to two concurrent social movements in 1959, the first led by striking Mexican railway workers and the second by Fidel Castro. Suffering from low wages and government intervention in union management for over a decade, railway workers were discredited by the press and politicians as rebels and communists who “impeded the country’s development and modernization” (p. 73). In contrast, Castro’s movement received favorable coverage, as journalists compared the Mexican and Cuban revolutions and focused on Castro’s charismatic commitment to restore Cuban democracy and confront U.S. imperialism. A following chapter keeps us in 1959 and continues to explore the challenges Mexico faced in navigating increasingly polarized international politics. Televised diplomatic visits by Mexican, U.S., and Soviet heads of state frame González de Bustamante’s discussion of Cold War tensions that revealed discordance within the PRI about the relationship the country should develop with Cuba and the superpowers. While broadcast journalists had embraced the similarities between the PRI’s Mexico and Castro’s Cuba, this friendly gaze was not extended to the Soviet Union as it attempted to extend its sphere of influence outside the earth’s atmosphere. The book’s fifth chapter examines how Mexican politicians and news executives mediated criticisms of U.S. imperialism by supporting their northern neighbor in the Space Race. Favorable news reports and collaborative space projects improved relations and highlighted Mexico’s technical progress. The tensions she introduces in the previous chapter came to a head during the Cuban Missile Crisis, which threatened the stability of the “political tightrope” Mexico walked between Cuba and the United States (p. 134). While President Adolfo López Mateos’ fortuitously scheduled Asian tour avoided him the role of middleman, Mexican news producers took the lead in denouncing both Cuba and the USSR. The book’s sixth and strongest chapter addresses the PRI’s struggle to maintain social order ahead of the 1968 Summer Olympics. As the first Latin American host, Mexico had a world stage on which to display the trappings of its economic success. But by pledging to broadcast the games live and in color for the first time, Telesistema ran the risk of opening room for the faces and placards of those not enchanted by the “Mexican Miracle.” The country prepared for the games by embarking on a massive construction campaign to build venues and improve infrastructure. In a lesson from which current Brazilian politicians failed to learn, Mexico’s Olympic planners met intense criticism from university students, who decried the PRI’s choice to spend hundreds of millions of dollars while half of the city lived as squatters (p. 149). Though the media cooperated with the government, the events of 1968 strained this relationship. The book’s last chapter analyzes the impact of this watershed moment in Mexican history on Telesistema and its emerging competitors. From oral histories conducted with news executives, González de Bustamante describes how the belief among PRI leadership that television was to blame for inspiring political dissent led to reprisals. Instead of levying punitive taxes, the state demanded networks reserve a percentage of airtime for government use and granted concessions for new networks. Fearing further action from a newly created government watchdog organization, Telesistema executives moved to self-censor and standardize news by establishing a corporate news division under the leadership of Miguel Alemán Velasco (a former president’s son) and Emilio Azcárraga Milmo (son of Azcárraga Vidaurreta). This reorganization gave rise to 24 Horas, the country’s longest running nightly news program with the iconic Zabludovsky at the helm. The overlapping World Cup tournament and presidential elections in the summer of 1970 gave Telesistema a chance to repair its relationship with the PRI. Alemán Velasco and Zabludovsky travelled exclusively with PRI candidate Luis Echeverría, who won with more than 85% of the national vote. World Cup coverage, in turn, put five Mexican cities on display and highlighted the graciousness of Gustavo Díaz Ordaz, the outgoing president villainized by the student movement, who presented the cup to the victorious Brazilian team. González de Bustamante’s account comes to a close with the 1972 death of Azcárraga Vidaurreta and the transfer of executive control to his son Azcárraga Milmo. The second generation Azcárraga, whose politically sensitive business acumen got him the nickname El Tigre (The Tiger), oversaw a merger with a smaller network in 1973, from which Grupo Televisa was created. Each chapter’s consistent grounding in the larger arc of Mexican and international history makes “Muy Buenas Noches” an easily digestible book, even for those with little previous knowledge of the country. Well-versed readers, however, may be left wanting more analysis of some of the fascinating issues at which González de Bustamante only hints. For example, her last chapter briefly alludes to Telesistema’s transnational coverage in 1970 of how Mexicans living in the exterior, specifically in the United States, celebrated Independence Day. This detail reveals a rich avenue of inquiry to understand the Mexican press’ role in creating a transnational mexicanidad. The book also opens room for complementary conversations on the impact of broadcast journalism on gender (especially expressions of masculinity and femininity) and vice-versa beyond her short account of the rise of female reporters and anchors. Last, the book’s focus on elite control of the media begs a second volume addressing in further detail the response of dissenting voices. Was the PRI’s opposition, although in an obviously limited capacity, also able to utilize television as a tool of subversion? In 1990, ten years before the PRI’s presidential streak was broken by the National Action Party (PAN) candidate and former Coca-Cola executive Vicente Fox, Peruvian novelist and Nobel laureate Mario Vargas Llosa declared Mexico to be a “perfect dictatorship.” Speaking at a Televisa-sponsored event, he referred to the company as a party soldier that had helped camouflage the PRI’s authoritarianism. Over the last 25 years, however, drug cartel violence against journalists has been blamed as the largest impediment to Mexico’s freedom of information. A 2013 Reporters Without Borders report focuses on cartel intimidation, but also cites market monopolization and poor transparency by Televisa and its rival TV-Azteca as determining factors in Mexico’s ranking as the most dangerous Latin American country for journalists. Undoubtedly, “Muy Buenas Noches” will stand as a central text for future researchers intrigued by the questions González de Bustamante raises, as well as those searching for the historical roots of the country’s current media climate. University of Nebraska Press, 2013, 314 pages, $40.00 paperback. Taylor Jardno is a doctoral candidate in the Department of History at Yale University. She currently holds a fellowship at the Colegio de México, where she is researching the impact of private international schooling on the landscape of postrevolutionary Mexican education.